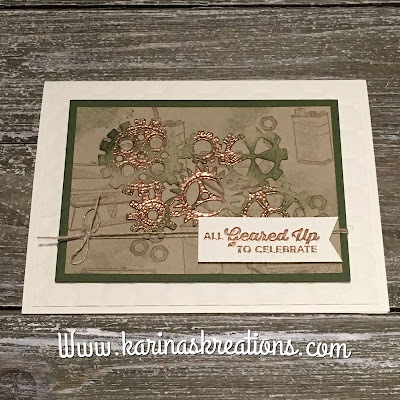 Karina's Kreations: Geared Up Garage Antique Technique Card! Geared Up Garage Antique Technique Card! 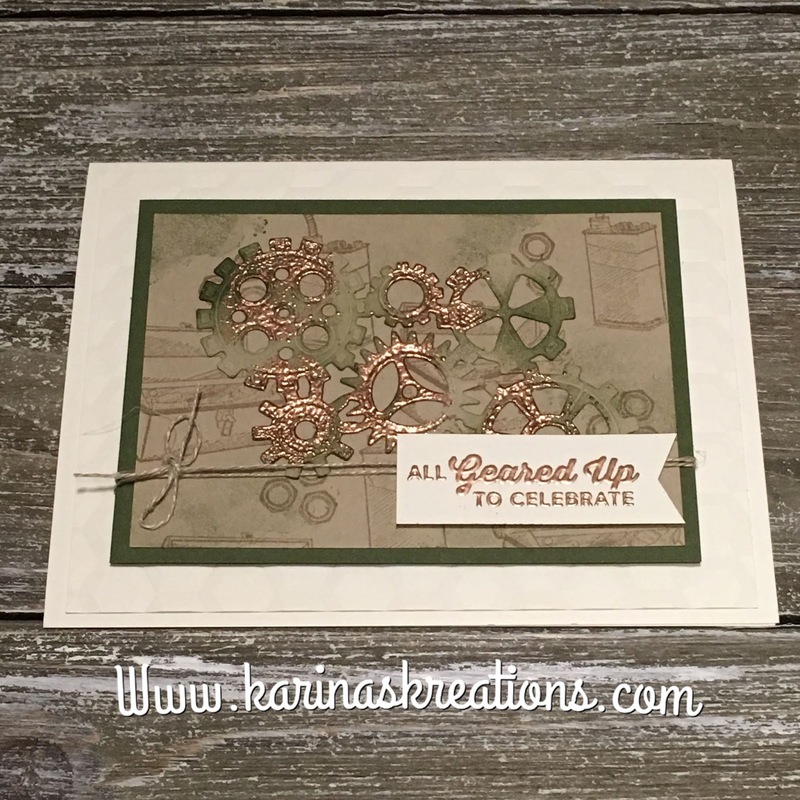 The Geared Up Garage stamp set is really fun to create with. It lends itself to many different card designs and scrapbook layouts. Today I'm sharing the antique technique to use with this set. 1. Cut a piece of 3" x 4" Crumb Cake card stock. Cut out the large gear shape using a Gear Garage Thinlit Die. TIP: I like to add a layer of wax paper between my die and the card stock. 2. Use the Die Brush from Stampin'Up to remove the extra bits from the die. 3. Sponge Mossy Meadow ink over part of the gear. 4. Place a few drops of Versamark in refill on the lid of the Versamark ink pad. Sponge VersaMark ink over the Gear. 5. Cover with Copper Embossing Powder. 6. Heat with a Heat Tool. I'll be sharing this technique on my face live video Tuesday April 9 at 1:00. Karina's Facebook Page! To order any of the products used to make this card, just click on a picture below to go to my online website.